Important note: Not all prepaid customers can borrow SRD18. How do I check my Top up advance? How long can I use top up advance? There is no end date for this service. 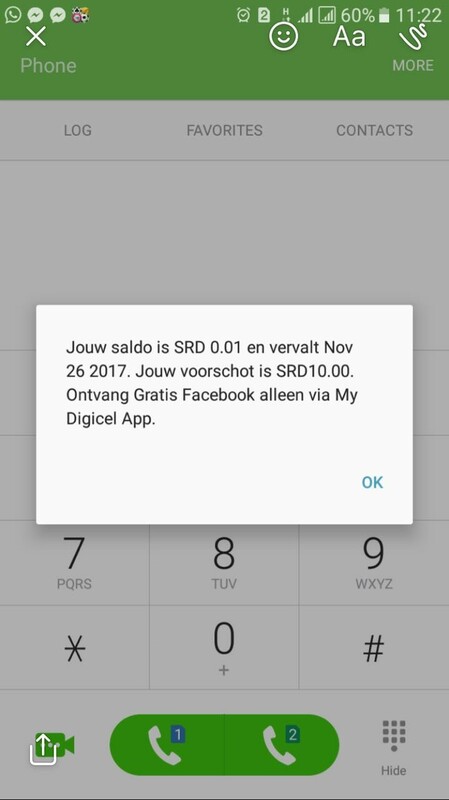 Please note that Digicel has the right to change the conditions of this service with or without a notification. How much do I pay to make a call with the advance? The normal rates apply to make calls with the advance. There are no additional costs to make calls. To view the rates click here. Should I have a minimum amount of credit on the balance in order to take an advance? Is it possible to take an advance while roaming? No, you won't be able to take an advance while roaming. Please note that when you have an advance and you top up abroad while roaming then the credit will be deducted for payment of the advance. How many times can I take an advance? As many times as you want to. Please note after the first advance has been paid then you can take another advance. Will the credit of the advance expire? Yes it will expire. It expires with your main credit. In short you can use the advance credit as your main credit.